We know what you’re thinking, a New York themed play area in Rotherham is an interesting theme, but perhaps a little random. However, you’d be wrong! Rotherham has strong links to the real Big Apple as the old Guest and Chrimes Foundry, which was based in the region, actually made the distinctive fire hydrants which are dotted around the streets of New York, USA. So with a distinctive and rather unique theme agreed from the start, how did we set about producing the Big Apple design? The 14,000 sqft building is a large industrial unit which required a D2 ‘change of use’ planning application. As well as having a large 14,000 sqft floor space, the unit has excellent height, reaching up to approximately 7m at the apex of the roof. Externally, the building has excellent parking and is visible and accessible just off the main road via a secure gate. Matt & Melanie Jackson, husband and wife owners of Big Apple, were familiar with Soft Brick’s product after Matt's company UK Workspace was involved in the fit out for another Soft Brick customer – Riverside Hub in Northampton. 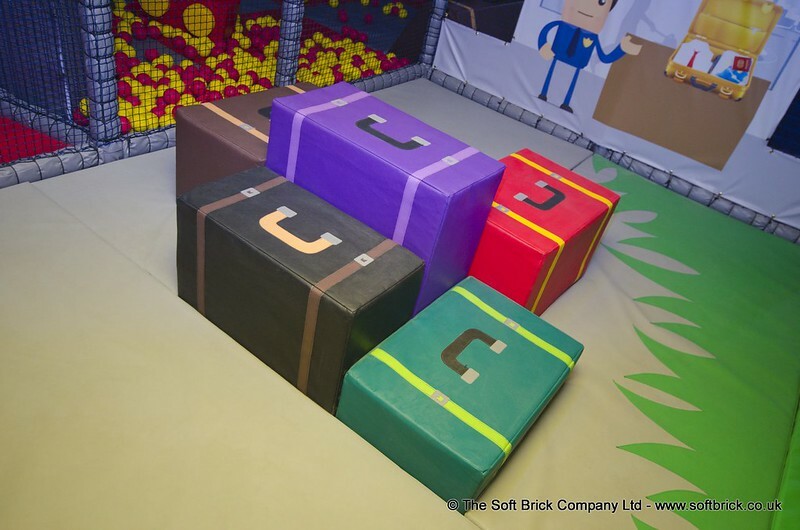 After meeting the Soft Brick team at LIW in 2013 and viewing our World of Play product up close, both Matt & Melanie were confident Soft Brick would be able to produce the type of educational design and quality they were looking for. After arranging a site visit and receiving CAD plans, our designers got to work! Electronics / Sounds – for that extra bit of WOW! Our design team had plenty of sources of inspiration – including some of the existing features from our World of Play range. Some of the ideas we came up with included a stars & stripes slide, a ‘mini’ Statue of Liberty, Skyscrapers, an actual ‘Big Apple’, a Brooklyn (rope) Bridge and Times Square! Melanie was very excited at the ideas our designers had developed and the quotation was right on budget. With the building lease signed and building works already started, the design and quotation was agreed – we are good to go! With a final site survey by our engineering team to confirm all the dimensions on site, we were ready to begin specification of the product. With the Colour Checklist all signed off, Melanie asked could we help with her marketing by taking photos of the products going through the factory, which of course was not a problem! The theming for this design was always going to be key – both on the interior appliquéd products and printed exterior theming. Our manufacturing and specification techniques have been finely developed over the years to ensure our soft play structures are suitably themed without compromising visibility – and Big Apple was no exception. The large exterior PVC panels depict the famous Chrysler, Empire State and Flat Iron buildings with a large scale model of the Statue of Liberty acting as the central linking piece between the Brooklyn Bridge and Manhattan Bridge. As you walk around the system you will visit many of the diverse areas within New York, such as the skyline of Manhattan, the Metro underground system, Madison Square Garden sports arena, the docklands of the Hudson River, Little Italy, China town. These landmarks all start with the arrivals at JFK Airport! Of course, Soft Brick’s designs go way beyond just theming – which was another key consideration for the vision for Big Apple. As mentioned above, Matt & Melanie were already familiar with two of Soft Brick's World of Play builds - they knew the level of innovation and play value was exactly what they were looking for to ensure their customers keep coming back for more. So how did the design team fit features into the design that had been influenced by places all over the World - not just New York, let alone America? Well with a bit of a tweak here and there, it actually worked really well! The Empire State Building gets struck by lightning around 100 times per year - making it an ideal location for our Lightning Deck feature! The Museum of Natural History houses one of the greatest collections of dinosaur fossils in the World - great for our Lost World features which includes a giant Matching Shapes Bone panel! The specific regions of New York like Little Italy & China Town meant we could introduce more World of Play product whilst still being an accurate reflection of the real thing. New York is a haven for sports! The New York Yankees, Knicks, Mets, Rangers, Giants and quite a few more all have arenas or stadiums in and around the city. The Sports court in Big Apple features a football pitch (as in soccer!) and basketball rings – and is themed on one side as Madison Square Garden and Yankee Stadium the other! We have a Battlezone arena themed as a Bank - with a twist - to represent the Financial Quarter of NYC. The twist is, that we’re transported back in time to the 1930s – to an era of gangsters and bank robberies! Will you play as an NYC cop or the naughty gangsters of Brooklyn! Soft Brick are happy to say we completed the Big Apple build right on schedule and think it’s one of our favourite builds to date. We managed to overcome some minor delays with building works, but working together with Matt and the other contractors on site, works were completed on time and Big Apple was open! Adapting our World of Play products to suit a single, continuous New York theme proved to be challenging at times, but the outcome is something we’re especially proud of – as are Matt & Melanie! Everyone at Soft Brick would like to wish Big Apple the very best of luck for the future! Be sure to check out the photos and stop by to check it out for yourself! Big Apple is approaching it's first birthday this December and they have already been introducing some exciting new equipment. Earlier this year Soft Brick installed a new, under the sea themed 'Sensory area' into a purpose built room separated from the main soft play structure. "Since we upgraded our sensory room and asked Soft Brick to design and install the new equipment the feedback we have had from our customers has been amazing – babies love it so much we have added a Baby Sensory class to our time table of events, we have also had several special needs schools approach us asking to hire the facility for private use." See www.bigappleplay.co.uk for more information - and also check out the feedback on Big Apple's Facebook page!